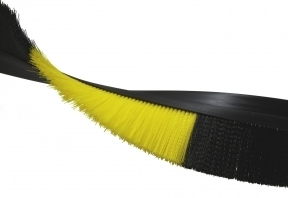 Tanis produces this stapled set strip brush by securing one or more rows of filament to a PVC backing. Common applications of these brushes include sealing shielding, guiding and cleaning. Stapled set strip brushes are used for cable management seals for data server towers and cabinets, cleaning conveyor belts and chains, mist control shields around spraying equipment, and weather stripping seals around overhead door enclosures. Our stapled set brushes are available in both flexible and rigid backings. The Flexible PVC Strip Brush contours and forms to irregular shapes, addressing problems the metal back brushes cannot solve. It includes an integrated Clip Style backing, making placing and moving the brush fast and easy. The Rigid PVC Strip Brush is a non-corrosive alternative to the metal back, it features an integrated h-Profile for quick and easy vertical mounting without needing to purchase a separate holder. We have a large variety of shapes, sizes and backing styles in our strip brush offering. Non-standard overall trims, overall lengths and fill materials are available upon request and our engineers can help recommend or design the right brush for your special application.